Using sst and a hammer, unstake the staked part of the hub lh nut. while applying the brakes, remove the hub lh nut. : loosen the staked part of the nut completely, otherwise the screw of the drive shaft may be damaged. Remove the nut, separate the front stabilizer link assy lh from the shock absorber assy front lh. : if the ball joint turns together with the nut, use a hexagon wrench (6 mm) to hold the stud. Remove the bolt, separate the speed sensor front lh and flexible hose from the shock absorber assy front lh. Remove the bolt, separate the speed sensor front lh from the steering knuckle. Remove the cotter pin and nut. 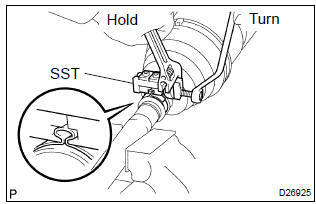 using sst, separate the tie rod end sub–assy lh from the steering knuckle. Remove a bolt and 2 nuts, separate the front suspension arm sub–assy lower no.1 Lh from the lower ball joint. Using a plastic hammer, separate the front drive shaft assy lh from the front axle assy lh. W/ abs: be careful not to damage the speed sensor rotor. Using sst, remove the front drive shaft assy lh. : be careful not to damage the dust cover and oil seal. : in case of not being able to remove the drive shaft at the position of the illustration (a), hook the claw of sst to the position of the illustration (b), remove it. : remove the rh side by the same procedures as the lh side. : the hub bearing could be damaged if it is subjected to the vehicle weight, such as when moving the vehicle with the drive shaft removed. Therefore, make sure to support the hub bearing with sst when the vehicle weight is applied. Check that there is no remarkable play in the outboard joint. check that there is no remarkable play in the radial direction of the inboard joint. : keep the drive shaft assy level during inspection. Using a needle nose pliers, remove the inboard joint boot lh no.2 Clamp as shown in the illustration. using a side cutter, cut the inboard joint boot lh clamp, then remove it. separate the inboard joint boot from the inboard joint sub–assy lh. Remove the old grease from the inboard joint sub–assy lh. 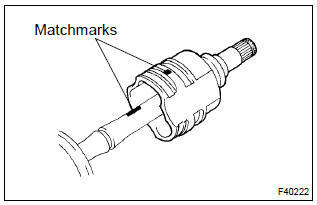 place matchmarks on the inboard joint sub–assy lh and outboard joint shaft assy. : do not punch the marks. Remove the inboard joint sub–assy lh from the outboard joint shaft assy. using a snap ring expander, remove the inner lh shaft snap ring. 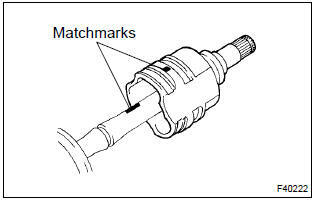 Place matchmarks on the outboard joint shaft assy and tripod joint assy. using a brass bar and a hammer, remove the tripod joint assy from the outboard joint shaft assy. : do not tap the roller. remove the inboard joint boot lh no.2 Clamp, inboard joint boot and inboard joint boot lh clamp. using a side cutter, cut the drive shaft damper setting clamp, then remove it. remove the drive shaft damper. Using a screwdriver, remove the lh hole snap ring. Using sst and a press, remove the dust cover lh. Using sst and a press, install a new dust cover lh, as shown in the illustration. dust cover should be installed completely. install a new lh hole snap ring. Through the damper setting clamp to the shaft. Mount drive shaft in a soft vise. secure the damper setting clamp onto the damper. place sst onto the damper setting clamp. tighten the sst so that the clamp is pinched. : do not overtighten the sst. Using sst, adjust the clearance of the damper setting clamp. : before installing the boot, wrap the spline of the drive shaft with vinyl tape to prevent the boot from being damaged. install new parts to the outboard joint shaft assy in the following order. Using a snap ring expander, install a new inner lh shaft snap ring. 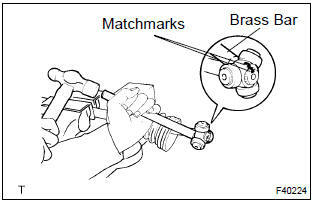 Align the matchmarks, install tripod joint assy to the outboard joint assy. using a brass bar and a hammer, install the tripod joint assy. pack the inboard joint sub–assy lh with grease. 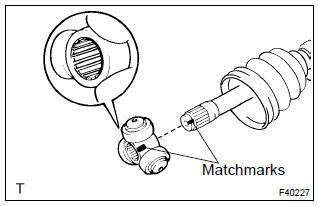 Align the matchmarks, install the inboard joint sub–assy lh to the outboard joint shaft assy. install the inboard joint boot to the inboard joint assy and outboard joint shaft assy. secure the clamp onto the boot. place sst onto the clamp. Using sst, adjust the clearance of the clamp. Sst 09240–00020 (09242–00150) clearance: 1.5 Mm (0.059 In.) Or less. Using a needle nose pliers, install the inboard joint boot lh no.2 Clamp as shown in the illustration. : for dimension (a), refer to the following table. A/t: coat the spline of the inboard joint shaft assy with atf. m/t: coat the spline of the inboard joint shaft assy with gear oil. align the shaft splines, install the drive shaft assy with a brass bar and a hammer. set the hole snap ring with opening side facing downwards. : whether the inboard joint shaft is in contact with the pinion shaft or not can be known from the sound or feeling when driving it in. : install the rh side by the same procedure as the lh side. : do not damage the oil seal. install the drive shaft assy lh to the front axle assy lh. Install the lower ball joint to the front suspension arm sub– assy lower no.1 Lh with a bolt and 2 nuts. install the tie rod end sub–assy lh to the steering knuckle with the nut. install a new cotter pin. : if the holes for the cotter pin are not aligned, tighten the nut further to 60 . Install the speed sensor front lh and flexible hose to shock absorber assy front lh with the bolt. Install the speed sensor front lh to the steering knuckle with the bolt. Keep the speed sensor clean. Install the front stabilizer link assy lh with the nut. Install a new hub lh nut. using a chisel and a hammer, stake the hub lh nut.